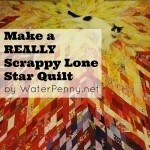 If you spend a lot of time looking at quilts on-line (guilty!) I know you will recognize this design from a few that have been floating around. 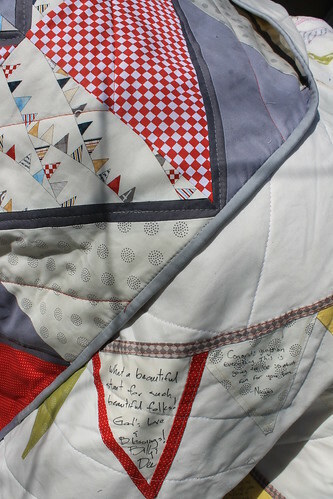 It is my new favorite design for wedding signature quilts – the bride had the flags at the wedding and then she mailed them to me to sew onto a quilt. So, this isn’t a work in progress – it’s finished! Yay! We had a non-terrible day so I was able to take some photos yesterday. Don’t worry, it’s snowing and freezing again this morning. 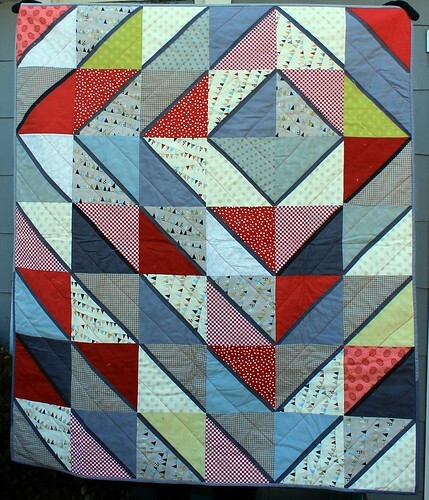 The back is this diamond/lattice/HST hybrid quilt that I love. 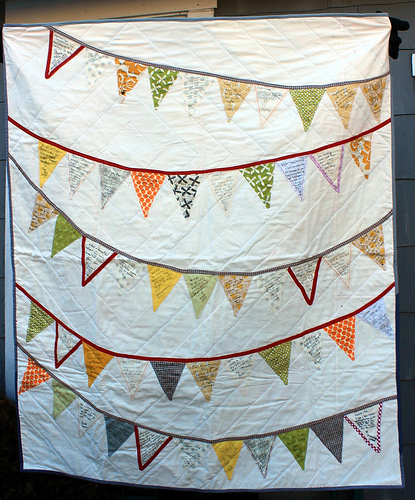 With Moda Reunion bunting flag fabric in there – so perfect ! 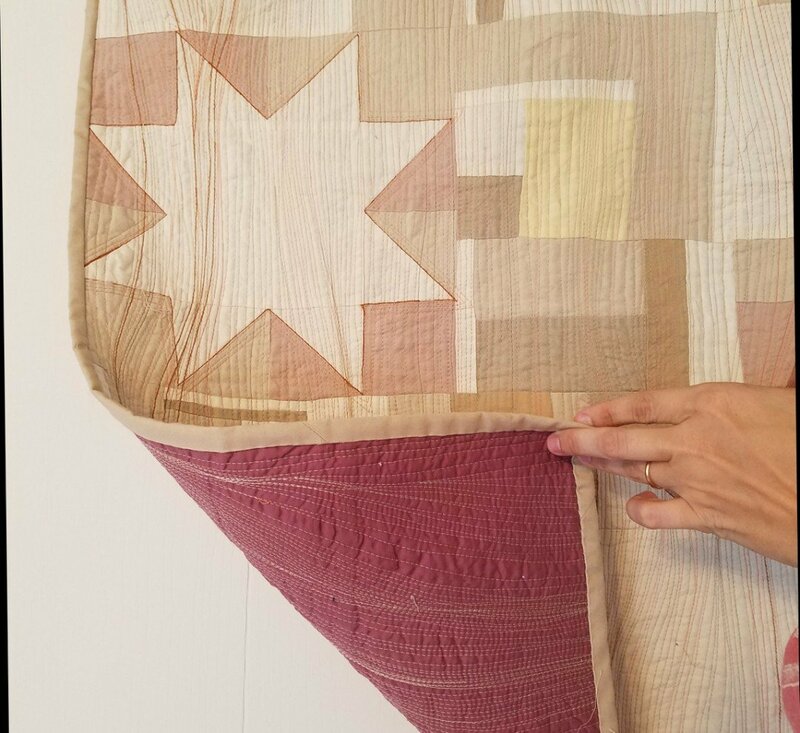 I recently made a book of all my quilts to bring to a local wedding craft fair (it was such a lovely event) and my husband pointed out that my quilt photos are kind of like taking a weird tour around our house. My red door features prominently in many of them! 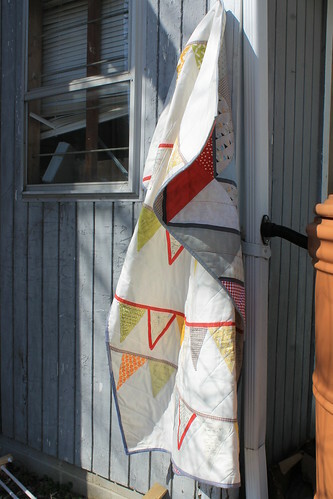 And here is a final shot with the quilt all wadded up in a pile, the quilts natural resting habitat. I’m linking up with Freshly Pieced and all the other beautiful things happening this Wednesday! Love the HSTs. 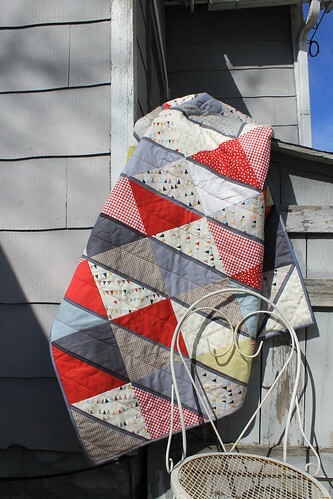 Some of my favorite quilts to make! I love the flags idea and the back of the quilt fits the front perfectly. Well done! As for the photos, what nice places you choose. During the school year I am not home most of daylight so I wind up taking photos in my classroom…a science lab. 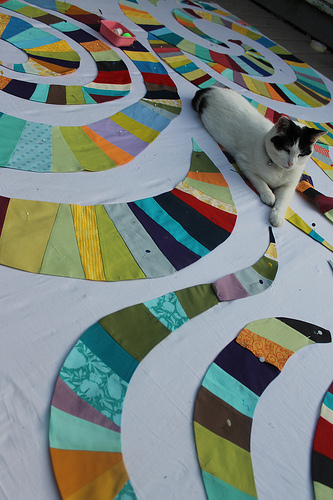 Perhaps I should start draping quilts on my skeleton! 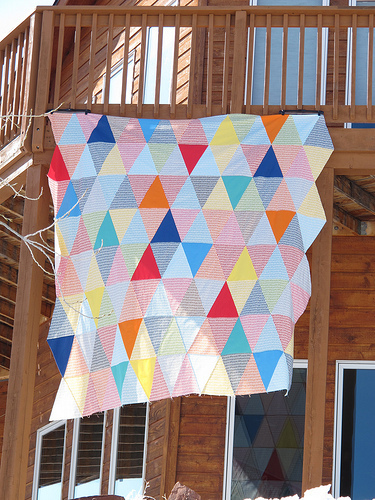 That’s an awesome idea for a wedding quilt/guestbook! I might just nick it from you/ twist it a little bit when my sister is getting hitched next year. Any tips on the markers to use to make it last forever? Oh, and the back is gorgeous, too! Love the off-centre touch. 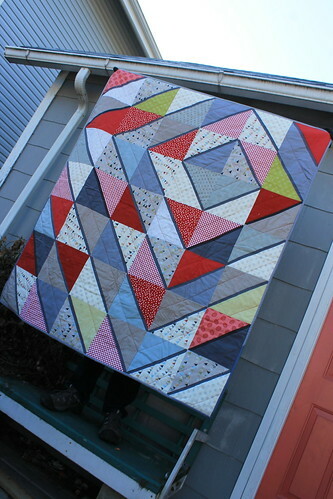 Beautiful quilt! 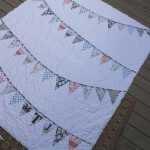 The bunting guest book is a great idea and you turned it into a wonderful quilt!